Nice to look at, easy to listen to! 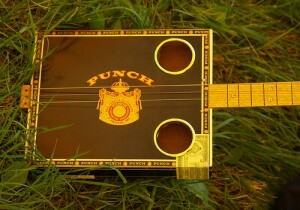 The cigar box guitar is a primitive chordophone that uses an empty cigar box for a resonator. “Guitar” refers to the traditional instrument and to a string bass. The earliest predecessors had one or two strings; the modern model typically uses three or more. Generally speaking, strings are connected between the end of a broomstick or 1″ x 3″ wood slat and to the resonator, the cigar box. Trace evidence of cigar box instruments exist from 1840 to the 1860s. The earliest illustrated proof of a cigar box instrument known is an etching copyrighted in 1876 of two Civil War Soldiers at a campsite with one playing a cigar box fiddle. The etching was created by illustrator and artist Edwin Forbes who, under the banner of Frank Leslie’s Illustrated Newspaper, worked for the Union Army. The etching was included in Forbes work Life Stories of the Great Army. In the etching, the cigar box fiddle clearly shows the brand ‘Figaro’ on the cigar box. In addition to the etching, plans for a cigar box banjo were published by Daniel Carter Beard, co-founder of the Boy Scouts of America, in 1884 as part of ‘Christmas Eve With Uncle Enos.’ The plans, eventually retitled ‘How to Build an Uncle Enos Banjo’ as part of Beard’s American Boy’s Handy Book in the 1890 release as supplementary material in the rear of the book. These plans omitted the story but still showed a step-by-step description for a playable 5-string fretless banjo made from a cigar box. The cigar box guitars and fiddles were also important in the rise of jug bands and blues. As most of these performers were black Americans living in poverty, many could not afford a “real” instrument. Using these, along with the washtub bass (similar to the cigar box guitar), jugs, washboards, and harmonica, black musicians performed blues during socializations. A modern revival of these instruments (also known as the Cigar Box Guitar Revolution) has been gathering momentum with an increase in cigar box guitar builders and performers. A loose-knit tour of underground musicians tour the East Coast (US) each summer under the banner “Masters of the Cigar Box Guitar Tour.” These musicians include Doctor Oakroot, Johnny Lowebow, Tomi-O and many others. Modern revival is sometimes due to interest in jugband and the DIY culture, as a cigar box is relatively inexpensive when considering other factors, such as strings and construction time. 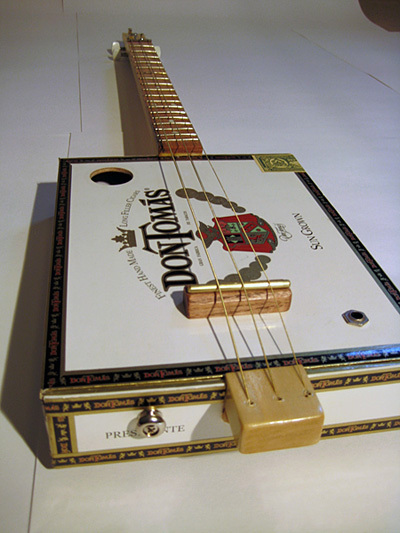 Many modern cigar box guitar can thus be seen as a type of practice in lutherie, and implement numerous personal touches, such as the addition of pick up and resonator cones into it . 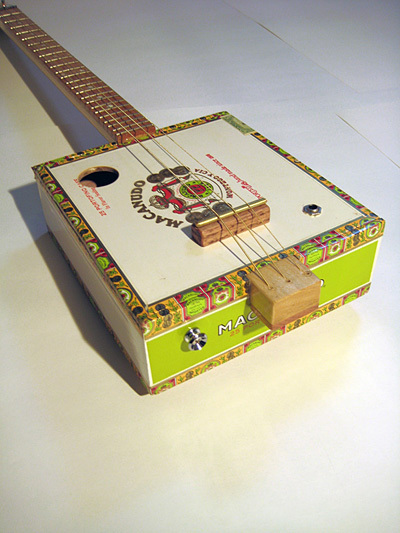 The modern revival of cigar box guitars is documented in the 2008 film, “Songs Inside The Box” which was shot primarily at an annual Huntsville, Alabama event called the Cigar Box Guitar Extravaganza. • Billy Gibbons of ZZ Top performs with a cigar box guitar made by Kurt Schoen. • Richard Johnston, the subject of the 2005 Max Shores documentary Richard Johnston: Hill Country Troubadour, performs with a Lowebow. • Tom Waits plays cigar box banjo on his album Real Gone. • Ed King of Lynyrd Skynyrd plays a cigar box guitar made by Tomi-O. • Harry Manx, a Hindustani slide master, plays a Lowebow cigar box guitar. • Chris Ballew, lead singer of The Presidents of the United States of America, has recorded with a one-string cigar box bass made by Shane Speal. • Kevin M. Kraft, an eclectic singer-songwriter in Kansas City, Missouri, uses, as his instrument of choice his own home-built cigar box slide guitars almost exclusively. • Joe Buck, one-man-band performer and also a member of Hank Williams III’s band Assjack, plays a cigar box guitar made by Tomi-O. • Robert Hamilton of the Low-Country Messiahs plays a 3-string Tomi-O cigar box guitar. • PJ Harvey plays a Baratto Cigfiddle. • Lightnin’ Hopkins Played a cigar box guitar. • Alain Johannes plays a cigar box guitar in the entirety of his first solo record called “Spark”, and also on tour. • Reverend Peyton of The Reverend Peyton’s Big Damn Band plays a three string cigar box guitar.